We've seen that Rochester holds its own in the craft beer trend. But how about the Third Wave of coffee? I obtained my education on the Third Wave of coffee through the amazing local site rocwiki.org. Apparently, the First Wave represented coffee's spread worldwide (think Folgers.) The Second Wave took the First Wave to the next level (think Starbucks.) Now the Third Wave is taking the Second Wave to the next level. The source of the beans, the growing conditions, the roasting technique, and the brewing method are all taken very seriously. The flavor profiles are described in the same way as they would be for a fine wine. Has piddly Rochester jumped on board? Spin magazine seemed quite upset by Rochester's ranking. So I thought I would take the liberty of apologizing: "Dear Spin, on behalf of all Rochesterians, I sincerely apologize for not being the beat up Rust Belt town that you thought we were." 62 resort, semi-private, and public golf courses are located within a 45-mile radius of the center of Rochester. Golf Magazine and the National Golf Foundation have identified Rochester as the 10th best golf city in the country, in particular highlighting affordability. The LPGA Championship was played in Rochester from 2010-2014. The aforementioned Oak Hill Country Club has hosted the PGA Championship (as recently as 2013), the Ryder Cup, the U.S. Open, The U.S. Senior Open, and the Senior PGA Championship. Unbeknownst to coastal elites is the fact that the Rust Belt can be...trendy. Take, for instance, the craft beer trend. (I don't drink beer, but I read a lot about it...okay, that's not entirely true.) While corporate brewing still dominates the American beer market, independent brewers working on a smaller (and more tasty) scale have entered the beer scene in a big way. In fact, as of last year, craft had achieved an 11 percent volume share of the U.S. beer market. How does Rochester fare in this regard? The city of Rochester has four breweries (three craft breweries), with a fifth planned. Monroe County has somewhere along the lines of 10 breweries, not including breweries that utilize contract brewing. As of May 2014, the Finger Lakes Beer Trail, which extends from Rochester through the Finger Lakes and ends in Syracuse, boasted 69 establishments. Is Rochester like Denver, Portland, OR, or San Diego? No. But it's surprisingly competent. In 1838, Frederick Douglass escaped from slavery in Maryland. He ultimately settled in Rochester where he published the abolitionist newspaper The North Star and established Rochester as an important part of the Underground Railroad. He inspired Rochesterians to erect the first statue in the country which memorialized an African American citizen and is buried in Rochester's Mount Hope Cemetery. Susan B. Anthony, born in Massachusetts, spent her adult life in Rochester. As a prominent champion for women's voting rights, her work helped contribute to the 19th Constitutional amendment. Her home in Rochester is now a popular museum, and her famed illegal vote on November 5, 1872 is now the site of 1872 Cafe. She, too, is buried in Mount Hope Cemetery. In 2014, the U.S. Supreme Court was asked in Town of Greece v. Galloway to rule on the constitutionality of Christian prayer before legislative bodies (such as city councils.) The case originated in Rochester's largest suburb of Greece (hence the name.) While the court ultimately upheld Christian prayer, Greece subsequently allowed the first atheist invocation at its town board meeting. In 2014, the Human Rights Campaign released a Municipal Equality Index (MEI.) The MEI examines the laws, policies, and services of municipalities and rates them on the basis of inclusivity of LGBT people who live and work there. A total of 353 cities were examined with all states being represented. Rochester scored 100 out of 100, being one of only 38 cities to achieve a perfect score. Standard Commentary: It snows a lot. Standard Commentary: It is cold. Clarification: Yes, at times it can be a bit chilly. But some great cities are even colder. As of last year, the average December - February temperature in Rochester was 27 degrees. America's 3rd largest city, Chicago, sits at 26.4 degrees. Everyone's favorite college town, Madison, WI, finds itself at 21.6 degrees. And hipster haven Minneapolis comes in at 18.7 degrees. Clarification: Yes, the clouds occasionally block our view of the sun. But some great cities have even more cloud viewing pleasure. 62% of days in Seattle have at least 3/4 cloud cover, edging out Portland, OR which comes in at 61%. Both metro areas have been among the fastest growing in the country. Rochester has to be content at only 55%, perhaps explaining its slower population growth. The new knowledge economy has turned universities into engines of economic development. The Rochester region is fortunately blessed with many such institutions of higher learning. But the question must be asked: is the region's flagship university, the University of Rochester, up to the challenge? The U of R is not a brand name, made even worse by the fact that it is named after a city with a disrespected brand (hence the need for this blog.) Some data will hopefully help answer the question. According to City Observatory, from 2000-2012, the Buffalo metro area saw a 34% increase in the number of 25-34 year-olds with a college degree. According to the same source, 42.1% of the 25-34 year-olds in the Buffalo metro area have at least a 4-year degree. For some perspective, Chicago finds itself at 41.5%, Austin 40.8%, Seattle 39.4%, Denver 38.9%, Portland 37.1%, and Rochester 36.7%. The 2013 population estimate for Erie County, NY of 919,866 is higher than the 919,040 noted in the 2010 Census. Could it be (say it ain't so) that proximity to Buffalo is an asset? The Rochester Area Community Foundation has made it clear that Rochester has a poverty problem. Among similarly sized metropolitan statistical areas, the city poverty rate in Rochester of 32.9% is second only to Hartford, CT (33.6%.) Apparently Louisville, KY (18.4%), Oklahoma City (18.2%), and Albuquerque (17.9%) have the poverty issue under control. But how does Rochester really compare to these three "standouts"? Using 2010 Census data, the city of Rochester, which is constricted by old geographic boundaries, comprises 19.5% of its metro area. Less restricted Louisville...48.3%. Oklahoma City...46.2%. Albuquerque...a whopping 61.5%. Clearly, poverty should be addressed. But let's not make our perception problem worse than it needs to be. 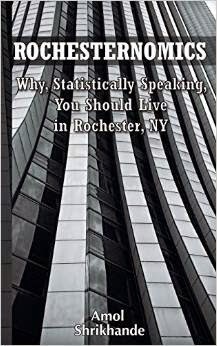 Prior to moving to Rochester, I was asked the following questions (really.) After almost 5 years of living in the area, I feel more equipped to answer them. Q: Do they have car dealerships there? A: You mean those places where they sell cars? Like Chevrolet, Ford, Honda, Toyota, BMW, Mercedes, Porsche, Jaguar, and Maserati? Q: Is it something like Williamson, WV? A: The population of Williamson is around 3,000. The city of Rochester's population is around 210,000. So not really. Q: Are there any cultural outlets? A: I don't get out much, but I have heard there are these things called museums, art galleries, universities, and restaurants. Someone also told me there is a music school which is apparently decent. Q: Is the University of Rochester a good school? A: I'm not sure, but for some reason U.S. News & World Report ranked it the same as William & Mary. Q: What kind of jobs do people have around there? A: In addition to the cultural things I already mentioned, there are these other things called banks, hospitals, schools, and law offices. I've heard that some other places actually make stuff. And I think there might even be a few, like, corporations. Q: Are you ready for the snow? A: Does it snow in Rochester? Kodak, headquartered here, once employed around 60,000 locally. After exiting Chapter 11 bankruptcy, it now employs under 3,000. Xerox, headquartered here until the 1960's, once employed around 14,000 locally. It now employs about 6,300. Bausch & Lomb, headquartered here until 2013, once employed 4,300 locally. It now employs under 1,000. The city of Rochester had a population of 332,000 in 1950. The population now hovers around 210,000. When Kodak employed 60,000 locally, the area workforce was around 414,000. Today, it has GROWN to over 500,000. When Kodak employed 60,000 locally, the Rochester Metropolitan Statistical Area had 971,230 people. Today, that number is approaching 1.1 million. So while Kodak shrank by 95%, the population GREW by perhaps 10%. The suburb of Webster, home to much of Xerox's local presence, GREW by 12.4% between 2000 and 2010. The suburb of Victor GREW by 43% between 2000 and 2010. Downtown Rochester (yes, downtown Rochester) GREW from 3200 residents in 2000 to 6100 residents in 2014. I am not naïve. Rochester is not New York City or Washington D.C. Nor does it match up well in what should be a fairer comparison to Portland, OR. Downtown Rochester, though improving, continues to lack the curb appeal that has become critical over the past twenty years. In many ways, Rochester has allowed its appearance to match its perception, creating a vicious cycle which has been difficult to break. Fortunately, curb appeal and the eye test don’t tell the whole story. In Rochester’s case, they actually mask a hidden reality of rugged intellect, interdisciplinary creativity, and remarkable resilience. This reality is borne out in a wide variety of data and statistics which consistently elevate Rochester from Rust Belt also-ran to a legitimate national (and at times international) presence. This blog will attempt to highlight such data in an attempt to overcome perception and reveal a hidden gem.